"This doesn't just go away… You have to fight with it, or you die." Amazon Studios has debuted the very first teaser trailer for Gus Van Sant's latest film, titled Don't Worry, He Won't Get Far on Foot, which is premiering at the 2018 Sundance Film Festival starting this week. The film shows on Friday night, and we'll be there at the world premiere. Based on John Callahan's memoir, the story follows a Portland slacker who nearly loses his life in a car accident, and lives in wheelchair after. He tries to give up alcohol and figure out how to live a better life, discovering a love for drawing "edgy, irreverent" newspaper cartoons. 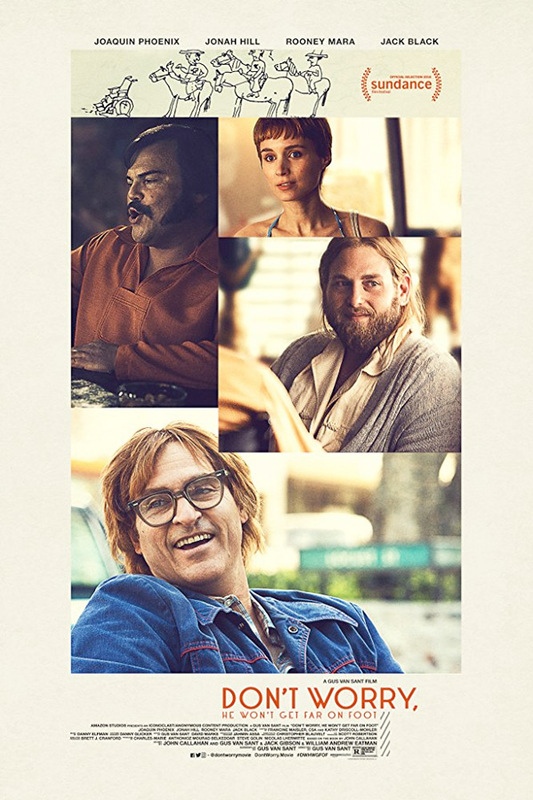 Joaquin Phoenix stars as John Callahan, and the cast includes Rooney Mara, Jonah Hill, Beth Ditto, Olivia Hamilton, Udo Kier, Kim Gordon, and Carrie Brownstein. I'm very impressed, this is a stellar teaser, with some excellent classic rock music and solid footage. Looking forward to catching this at Sundance soon. After Portland slacker John Callahan (Joaquin Phoenix) nearly loses his life in a car accident, the last thing he intends to do is give up drinking. But when he reluctantly enters treatment – with encouragement from his girlfriend (Rooney Mara) and a charismatic sponsor (Jonah Hill) – Callahan discovers a gift for drawing edgy, irreverent newspaper cartoons that develop a national following and grant him a new lease on life. Don't Worry, He Won't Get Far on Foot is directed by veteran American filmmaker Gus Van Sant, of many great films including My Own Private Idaho, Good Will Hunting, Psycho, Elephant, Finding Forrester, Paranoid Park, Milk, Restless, Promised Land, and The Sea of Trees previously. The screenplay is also written by Gus Van Sant, adapted from John Callahan's memoir. This film will first premiere at the 2018 Sundance Film Festival this month, then at the Berlin Film Festival next. Amazon Studios will release Don't Worry, He Won't Get Far on Foot in select theaters starting May 11th this summer. Your thoughts?